In this issue, we introduce our new publications, featuring themes ranging from the debate about gender and social protection, to the role of social networks as a methodology to discover social bonds in the analysis of selected cases of land credit programmes in Brazil, to an overview of social policies in Chile and Peru. We also share an interesting publication on the relationship between cash transfer programmes and psychosocial well-being in four African countries. The Working Paper “Overview of Chilean and Peruvian Social Policies: Impressions from a Study Tour” follows a study tour undertaken by a team of experts from the Planning Institute of Jamaica (PIOJ), that sought to gain practical knowledge on the operational and institutional aspects of Chilean and Peruvian social programmes and policies. Comprising five chapters, this study provides a discussion on the available mechanisms and tools for estimating the incidence of national poverty and extreme poverty, and presents the main cash transfer programmes in the two countries. This publication is authored by Pedro Arruda (IPC-IG), Luísa Nazareno (University of Brasília—UnB), Manoel Salles (IPC-IG), Juliana Alves (UnB) and Amélie Courau (IPC-IG), and is available in English. The associated One Pager, “Aspects of Chilean and Peruvian Safety Nets”, is available in English and Portuguese. In the One Pager “Gender and Social Protection: Current Issues and Policy Trends”, Raquel Tebaldi (IPC-IG), Ana Paula de la O. Campos and Maja Gavrilovic (Food and Agriculture Organization of the United Nations—FAO) summarise the main points of discussion during the same-titled webinar, which was part of a series on gender-sensitive social protection, a joint initiative by the IPC-IG and the FAO. This webinar sought to highlight the main issues for policy and research in the area of gender-sensitive social protection, summarising the existing evidence on how social protection can empower girls and women. This publication is available in English, French, and Portuguese. The One Pager “Cash Transfers and Psychosocial Well-Being: Evidence from Four African Countries” addresses a research gap by developing a framework to conceptualise ‘psychosocial well-being’ and presents evidence from an application of this framework to various cash transfer programmes evaluated by Oxford Policy Management (OPM) in Kenya, Ghana, Lesotho and Zimbabwe. This study was written by Ramlatu Attah, Valentina Barca, Andrew Kardan, Ian MacAuslan, Fred Merttens (OPM), and Luca Pellerano (International Labour Organization - ILO). It is available in English, French, and Portuguese. In the One Pager “Land Credit Policy in Brazil: Evidence from Social Networks”, Patricia A. O. Silva (Institute for Applied Economic Research—Ipea) and Marcelo M. de Magalhães (São Paulo State University—UNESP) explain how social networks were used as a methodology to discover social bonds in the analysis of selected cases of land credit programmes in the states of Bahia and northern Minas Gerais, using NetMap. This publication is available in English and Portuguese. The Policy in Focus magazine titled "Public policies for the strengthening of family farming in the Global South" is now available in Portuguese. Released in 2015, this special edition is the product of a collaboration between the IPC-IG, the FAO and the Brazilian Ministry of Agrarian Development (MDA). 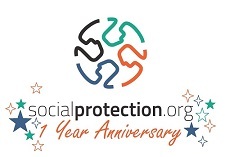 On 12 September, socialprotection.org blew out the candles and celebrated its first anniversary. The member-based online platform dedicated to issues of social protection is supported by the Development Working Group of the G20, financed by the Australian Department of Foreign Affairs and Trade (DFAT) and the German Cooperation Agency (GIZ), and it is hosted by the IPC-IG. Over the last year, socialprotection.org gathered more than 1400 members, 600 stakeholders and amassed over 2000 publications on a myriad of topics. The platform hosted 12 webinars in cooperation with a wide range of partners, and also houses 26 multi-language online communities dedicated to many topics related to social protection. Read more here. Speaking of knowledge-sharing on social protection, the platform will host two exciting webinars this month: on 28 September the second webinar of the ISPA Tools Webinar Series will be held, titled “The ISPA tools: the experience of Tanzania in the application of the tools”, in partnership with the Interagency of Social Protection Assessments (ISPA). You can register the webinar here. On 29 September, the webinar “Tools for Intersectoral Coordination :How to Integrate Social Policies in Conditional Cash Transfer Programmes” will be held. This is the second webinar in the series "The Brazilian Experience of Social Protection Programmes", organised by the Brazil Learning Initiative for a World Without Poverty (WWP) and supported by socialprotection.org. Register here. Missed the past webinars? You can view the presentations and listen to the sessions recordings of the webinar “The ISPA Tool: Assessing the Quality of Social Protection Payment Delivery Mechanisms”, held on 7 September here, and the webinar titled “Fiscal Space for Social Protection: Harmonization of Contributory and Non-Contributory Programmes”, held on 8 September here. A new study conducted by the IPC-IG shows that the illiteracy rate in the city of Maceió—capital of the Brazilian State of Alagoas—was reduced to 8.3 per cent from 11.4 per cent, between 2010 and 2015. With this reduction, the illiteracy rate in the city is closer to the national rate of 8.7 per cent. 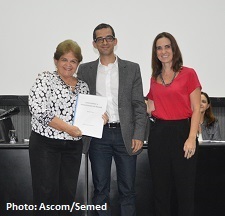 IPC-IG Research Coordinator, Mr. Rafael Osório, presented the results of the study to the Municipal Secretary of Education, Mrs. Ana Dayse Dórea, during an event held in Maceió, on 24 August. Prepared under the supervision of the UNDP Brazil Country Office, the report provides inputs for the municipality to reach the goal of the National Plan of eradicating illiteracy by 2024.